This entry was posted in Uncategorized and tagged freebie, pics, rambling, WW2. From top left: quad 20mm Flak 38, 88mm Pak 43, 50mm Pak38, Pak 97/38 (French 75 on Pak 38 mount). Free sweets eh? 2 out of 4 Tim- it was slightly more difficult than that. The sweets are still up for grabs. 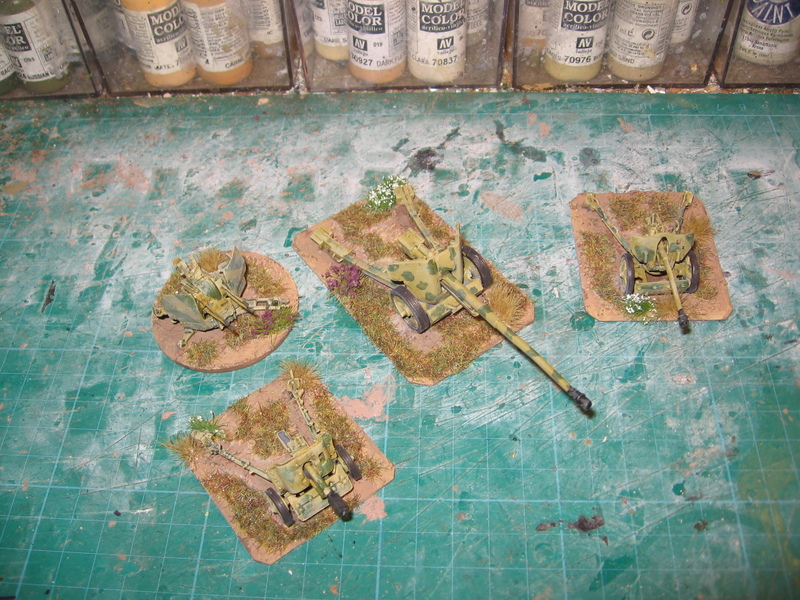 German Quad 20mm Flak; German Pak 40, German Pak 38. The gun in front is interesting. It is on a Pak 38 carriage and could be either a Pak 97/38 or a very late war IG37 Infantry Gun. The IG37 had a square muzzle brake, the Pak 97/38 a pepper-pot muzzle brake. I am having difficulty telling which one it is because of the angle of the picture. Close but no quite again. When I’ve next got the camera in the shed I’ll take some more pics from a different angle. If that is a Pak 43/41 it isn’t a very good model. The barrel isn’t long enough. Metal instead of plastic mold I would suspect. See http://www.flickr.com/photos/69768863@N00/2594535358/in/set-72157604253869731/ and look in the lower right corner for the gun under the camo net. 1/35 Pak 40 with a 1/48 88L70 from a Nashorn. Also see picture http://www.flickr.com/photos/69768863@N00/2594521206/in/set-72157604253869731 for a rear view.